I love plants. I love looking at them. I love potting them. I love watering them. I love choosing sunny little spots for them to live in. The plant love is real. Among the countless frivolous reasons I have for loving plants, I also have some fairly legitimate reasons for thinking we should have more plants in more places, particularly in places where we are asking students to focus, stretch their minds, and explore new ideas. The research and science behind the benefits of houseplants in workspaces is very interesting and relatively sound. 1) Plants help us focus and make us more productive. Field research performed in 2014 by Nieuwenhuis et al. and reported in an article in the Journal of Experimental Psychology: Applied showed that workplace culture and productivity both improved notably in scenarios where the space in which employees worked featured houseplants. Exeter University’s Dr. Knight has been studying this phenomenon for over a decade, finding that employee productivity increased by an average of 15% when bare workspaces were updated to include a few indoor plants. Employee performance also increased based on quantitative tests measuring memory retention and other skills following the inclusion of houseplants into the workspace. 2) Houseplants improve indoor air quality. Lacking the ventilation of outdoor spaces, indoor spaces can become fairly polluted. Air pollutants can emanate from adhesives, clothing, solvents, and a wide variety of other sources. Research by Stanley J. Kays from the University of Georgia showed that ornamental indoor plants are capable of filtering these pollutants from the air, improving physical and psychological wellbeing. More specifics on this research can be found here. 3) Plants help keep stress levels low. Chen-Yen Chang and Ping-Kun Chen published an article which investigated how window views and indoor plants impacted the levels of anxiety and nervousness of participants in the study. Stress levels were quantified by measuring participant’s electromyography (EMG), electroencephalography (EEG), and blood volume pulse (BVP). Subjects were unilaterally found to display less stress and anxiety when watching a view of nature and/or when indoor plants were present as compared to the individuals who had neither of these things. There is a pretty long list of additional suspected benefits or benefits in which the supporting research is a little shaky, but this list above is pretty soundly supported in my opinion. I firmly believe that including some greenery in the classroom has the potential to help some, if not all, students learn better. Particularly in New England, where a large portion of our year is spent with most of the greenery outside buried underneath a sheet of white snow, I think we do our students good by bringing some natural green into the spaces where they are asked to mentally and psychologically push themselves. At the end of the day, how much can it really hurt to add a houseplant or two to your classroom anyways? Might as well stick a few more plants in a few more places. For one of my graduate classes, I was asked to put together a text set for use in a high school literature unit. I chose to compile my text set around the ideals and concepts in Transcendentalist literature from the early 1800s; my goal was to create a body of texts that would work well in a literature unit for a 10th -11th grade class. I had such a great time putting it together that I wanted to post it here to share and for my own records. To preface my text set, I wanted to include Cynthia Shanahan’s thoughts on the definition of ‘text,’ which are very close to my own. With this broader understanding of what a text is, my text set incorporates some interdisciplinary texts that do not fall under the traditional category of written discourse. I started by including two visual texts, paintings by Thomas Cole. Cole was, in many ways, a very large part of the Transcendentalist movement. He is considered to be the founder of the Hudson River painters, who are a group of painters creating work between the in the mid 19th century. The Hudson River painters set out to create a uniquely American style, specifically in depicting unique American landscapes. 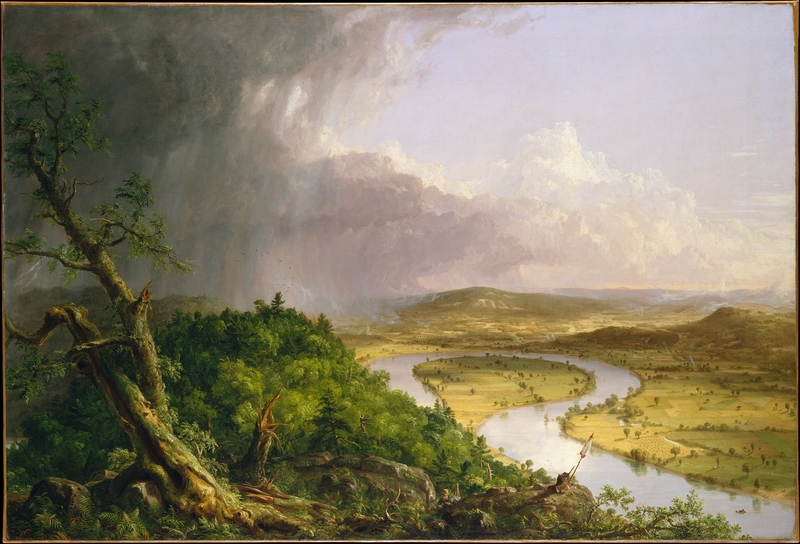 Thomas Cole held that if American nature could be studied and left undisturbed by men, then man could meet God in that nature. This philosophy aligned very closely with the Transcendentalist movement, which was going on at the same time that the Hudson River painters were establishing themselves. Cole and the Hudson River painters created visual representations of the ideals and concepts that the Transcendentalist authors wrote about. There are several layers of meaning to Cole’s Oxbow painting. The tame farmland is juxtaposed next to the wild and uncultivated woodlands, suggesting the diversity and open potential of nature. He also contrasts the wild and untouched nature of the woods to the land that has been marked by human interference. Cole places a small and insignificant image of himself in the middle foreground of the painting, suggesting his own insignificance in the grandeur and vastness of American landscape. He is seated in the woodlands overlooking the open pasturelands, situating himself as separated from the human-altered landscape. The purpose of this visual text is complex and ambiguous, although the genre of a pastoral painting is something that most students should be familiar with. The organization and layout of the piece is fairly straightforward; there is no real background or prior information necessary to critically assess this piece. The Mountain Ford painting also carries several layers of potential meaning. The lone individual is deeply immersed in wild and unaltered landscape. The notable focal point of the piece is the white horse, which is an example of nature that has been conquered by the influence man. 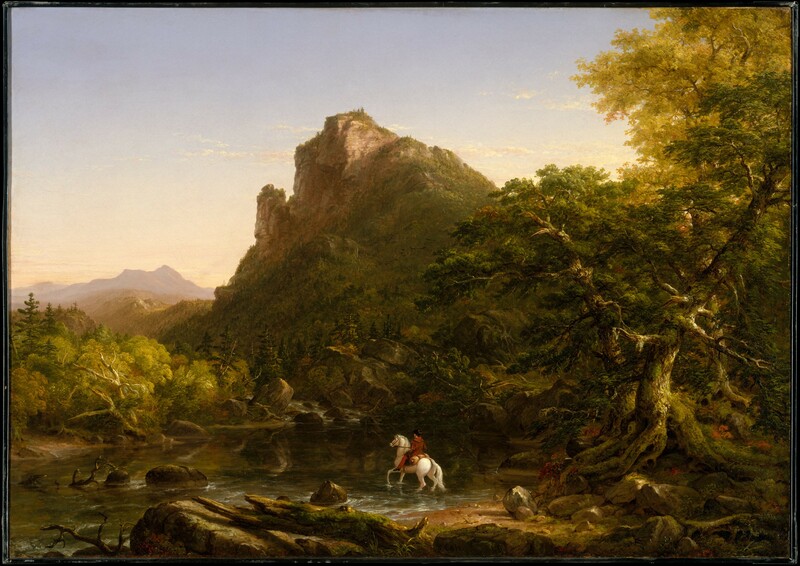 The man and his horse, however, are diminutive in relation to the grandeur of the surrounding landscape. The shadow of the large mountain falls over the man and reflects beneath him in the water, giving the natural surroundings a sense of deification, power, and glorification. The purpose of the piece is again, vague and ambiguous, offering multiple interpretations. The genre should be familiar to students, organization is straightforward, and no background or prior knowledge should be required. Emerson, R.W. “The Snow-Storm.” The Norton Anthology of Poetry. 5th ed. Ed. by M. Ferguson, M.J. Salter, and J. Stallworthy. New York: Norton & Company, 2005. 942. Print. This poem is a clear and accessible demonstration of transcendentalist ideology. In the poem, the mighty force of the overnight snow-storm builds beautiful, architectural snowdrifts and masterpieces in the “mad wind’s night work” (line 27). The implication is that what the artistry and creative spirit of nature is able to create overnight surpasses what humanity is able to do over centuries of architectural design and construction. The beauty of the snow covers over everything that man has made, leaving something far superior and more beautiful behind. Emerson deifies the snow-storm with the kind of generative power of a holy creator; the snow-storm comes in a night and creates beauty out of nothing. The Dale-Chall Readability Index places this text at a grade level of 11-12th grade, with 19% of the words not found on the Dale-Chall word list. Overall, this text would be a stretch text for an 11th grade class, but would provide an opportunity to really wrestle with some of the ideals of transcendentalism. As one of the few women known to have impacted the transcendentalist movement, I felt it was important to include a piece from Margaret Fuller. Her poem ‘Meditations’ captures the sense of independent self and self-realization in light of nature’s greatness; this approach greatly characterizes the spirit of transcendentalism. This poem in particular explores the idea of finding deity within ourselves and recognizing the inherent goodness in man and nature. The Dale-Chall Readability Index places this text at grade level for grades 9-10 with 14% of the words not found on the Dale-Chall word list. However, as the Dale-Chall Readability formula is unable to test for conceptual complexity of a work, I am identifying this piece as grade appropriate for an 11th grade English class based on its fairly dense theoretical and philosophical meanings. This website is a little dated, but it does have a somewhat comprehensive overview of the transcendentalist movement, the philosophies involved, work that resulted from the movement, and individuals who played major roles. The website offers photos, writings, as well as external links to material that all relate to transcendentalism in the 19th century. It would be an excellent resource for students to explore and use to construct some independent background knowledge concerning literature created during this movement as well as the beliefs that informed that literature. In using this text set, a middle-stakes, independent research assignment could be assigned requiring students to gather information from this site. The Dale-Chall Readability Index places this site as appropriate for grades 11-12, with 25% of the words not found on the Dale-Chall word list. I believe that this high score comes from the number of technical, web-based terms on the site. So, as long as students are familiar with online documents, this should not be a problem for them. Oliver, Mary. 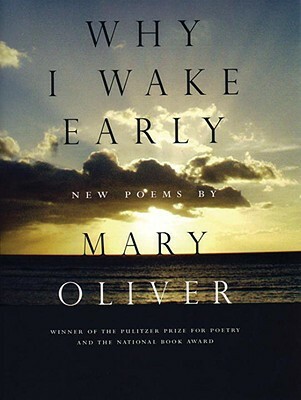 “Why I Wake Early.” Why I Wake Early: New Poems by Mary Oliver. Boston: Beacon Press, 2004. 3. Print. Mary Oliver is a modern day poet; however, much of her writing and philosophy mirrors those of the Transcendentalist poets we would be studying in this unit. This poem would give students the opportunity to reflect on Transcendentalist ideology outside of the time period in which we have been focusing, opening up discussion on whether or not that ideology is relevant today or for us as individuals. In qualitative terms, the difficulty level of this poem is low. The lines of short, simple, and use very basic vocabulary; syntax is standard and noncomplex. Standard English is used and the literary devices are straightforward and easy to understand. The meanings in the poem are simple and accessible; the purpose is easy to identify and reflect on. Most genre norms for poetry are followed in this piece, so students will be able to recognize much of what Oliver is doing. The Dale-Chall Readability index places this work at the 7-8th grade reading level. While this low reading level may not challenge students’ practical decoding skills, it will provide an opportunity to interact personally with the larger themes of this unit as well as to practice evaluating some of the Transcendentalist ideas we would have been studying. Porcellino, J., Thoreau, H. D., & Johnson, D. B.Thoreau at Walden. Hong Kong: Hyperion Books for Children, 2008. Print. This graphic novel adaptation of Henry David Thoreau’s, Walden, boils down the original work, highlighting key concepts, ideas, and quotes. These highlights are worked into the text’s artwork to create a unified sense of Thoreau’s journey and growth into his transcendentalist beliefs. The excerpts from Thoreau’s work are not used in chronological order, but have been rearranged to suit a narrative tale that follows Thoreau’s decision to live outside of society and the insights he drew from that experience. The intent of this novel is to give readers access to some of the central and most influential concepts in Thoreau’s work in a manageable and memorable format. Qualitatively and quantitatively, this text is an interesting blend of complexity levels. As far as genre, narration, and text graphics go, the text is fairly simple. The genre of the comic book is well-known, the narration is linear, the plot-line of the story is clear, and the graphics are simple to comprehend. However, the simplicity of the graphics does not remove the complexity of meaning from them. There are several potential purposes and meanings for many of the frames and students will have to be able to sort through those messages. The minimal text is largely figurative and conceptually dense. The ideas put forth are philosophical and largely metaphorical. Standard English is used; however, despite the deceptively simple format of the book, the register of the language is academic. Vocabulary words such as “magnanimity” and “dictates” are used. In order for the piece to make sense, my opinion is that background knowledge on Thoreau’s work Walden and the circumstances surrounding it is extremely helpful. In order to assist with the contextual information, the graphic novel has panel discussions at the back of the book that explain both the graphic and verbal choices made by the author in light of Thoreau’s history, personality, and works; much of the necessary background information can be found in the book itself. The Dale-Chall Readability Index placed panel discussions in the back of the book at a grade level appropriate for grades 11-12, with 25% of the words not found on the Dale-Chall word list. When I entered text from the panels themselves, however, the Dale-Chall Readability Index placed it at a grade level appropriate for grades 7-8. While this scoring may be accurate based on word use alone, the concepts and complexity of this text definitely surpasses 7-8th grade appropriateness. A phrase such as “making yourselves sick, that you may lay up something against a sick day,” would score fairly low on the Dale-Chall Readability Index; however, the syntax and conceptual content of this phrase makes it much more complex. Ultimately, the blend of complexity levels adds a level of complexity in and of itself. This text would absolutely require guidance and explanation in order for students to access it fully. I do believe, however, that it is a challenging and alternative way to interact with a major literary work from the transcendentalist movement. Thoreau, Henry David. “Chapter 2: Where I Lived, and What I Lived for.” Walden (Or Life in the Woods). Virginia: Wilder Publications, LLC., 2008. 51-62. Print. In order to have something to compare the graphic novel adaptation of Thoreau’s work against, it is important for the students to have experience with at least a small excerpt from the original. This chapter constitutes a good representation of many of the themes and ideas explored by Thoreau. 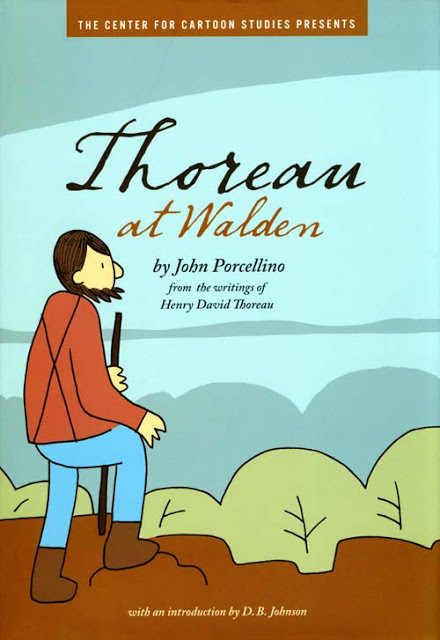 Without taking class time to read the entire work, this excerpt will give students direct experience with one of the more important literary works of the Transcendentalist movement while also informing their interactions with Porcellino’s graphic novel. In qualitative terms, this text is approximately grade level. The stream-of-consciousness style in which the prose is written is easy to understand, but lacks a narrative structure, meaning that students will have to work to follow Thoreau’s trains of thought. Many of the philosophical ideas or concepts that Thoreau reflects on are fairly complex and open-ended, which will create a mental challenge for the students; however the tone of the text is conversational and uses Standard English, making it accessible. This chapter also features several references to outside texts which will need to be explained to student readers. The Dale-Chall Readability Index places this text at a 7-8th grade reading level. Although the overall reading level is low, the text is punctuated by difficult vocabulary words such as “impounded,” “lustily,” and “auroral.” In considering the lower reading level combined with the more advanced vocabulary, extra-textual references, and some of the more advanced concepts and theories in the writing, I feel that this is a grade level text that will require some scaffolding in order to guide student understanding. Transcendentalism is one of my favorite themes through which to explore poetry. I find that students connect easily with some sense of spirituality and peace through nature, making much Transcendentalist writing accessible and meaningful to them. I also believe that attempting to write poetry in response to a feeling of connection or meaning found in nature is something that can be very therapeutic and rewarding for students. My idea behind this text set is to help students explore the mindset of the Transcendentalist writers so that they can try to enter into that mindset in their own personal writing and reading. Today is my mum’s birthday. My mum is a wild and free thing with an eye for adventure. She is a lifelong learner and a subject matter expert on kindheartedness in all situations. She is a nebulous blend of social butterfly and introvert. She is also an accomplished ping pong player, although it is said that my sister can beat her. Graduating with her MA as a Reading Specialist! Above all of these things, however, my mum is a teacher at her core. Before my sister and I even came along, she taught first grade at a small private school, where she was unilaterally adored. See below for evidence. When my sister and I were born, my mum homeschooled both of us while my family shipped around the world in a 52-foot sailboat. My mum filled our homeschool days with hands-on learning, creativity, and a passion for understanding. Somehow, my sister and I both came back to the states performing above our grade levels. When our church was in need of a high school youth leader, my mum shrugged and volunteered. Her young heart and passion for fun drew kids in and, within a year, youth group attendance almost doubled. My mum also teaches Sunday School at our church and has done so on and off for most of her life. Wrangling preschoolers anytime before noon on a weekend morning is a task I’m not well-suited for, but my mum is magic. She corrals them with laughs and smiles; they all learn and have a grand time together while most of the world is still fumbling for their morning coffees. Outside the classroom is actually where most of my mum’s teaching takes place. Her patient, humble, and silly heart naturally shares and encourages learning in those around her. She teaches forgiveness, goodnaturedness, and optimism to anyone lucky enough to spend time with her. Every year at Christmas, my sister and I unwrap and hang countless ornaments addressed to ‘Miss Oien’ or ‘Mrs. Hashem’ from a small sampling of the innumerable students whose lives she brightened. And I think how lucky I am to have learned most everything I know from a teacher like her. But really. Who needs them when you have students that can do this! A particularly inspirational fellow teacher and blogger, Rusul Alrubail, posted recently in response to this article. I found her post and this article to be so relevant and so heartbreaking that I wanted to dedicate my ever-so-tiny and modest far corner of the internet to this issue for a moment. The spark notes version of this article features a school in New York’s foreign language department that arranged for the US Pledge of Allegiance to be recited over the announcements in a different language each day for one week. After the day in which a school student recited the pledge in Arabic, the school received a barrage of complaints from students and parents. Complaints ranged from individuals saying that they had lost family in the war in Afghanistan to the sentiment that it was disrespectful to the Jewish members of the school body. The school issued an apology and declared that the pledge would only ever be read in English in the future. Because that’s America now. You’re welcome to be here, so long as you promise not to contribute any notable ethnic diversity or nonwhite culture to our system. I have a few, fairly separate, but mercifully brief points that I would like to make in response to this. 1) The people of Afghanistan do not speak Arabic. Dari and Pashto are the primary languages. But kudos on engaging in such a thorough and consistent level of ignorance. 2) When we start designating languages as representative of racial conflicts that are distinct to both a specific time and location, we are going to have to make some serious system changes. The day Arabic is offensive to the Jewish population is also the day that we will unfortunately have to start eyeing German suspiciously. 3) If anyone thinks that the brave men and women who give and have given their lives in the service of this country do so in order for us to have the freedom to limit the cultural heritage and expression of school children attempting to participate and engage in American ideals, I take extreme offense to that. I hope students everywhere feel that they can explore their identities as Americans in light of their cultural heritage. This is one of the factors that has made and does make America a great nation. My heart breaks for the students who see their identities as Americans forcibly divorced from and opposed to their cultural, racial identities. Kelly’s article explores the merits of using hip-hop texts in a high-school English classroom not just as a gateway into more canonical literature, but as a “genre worthy of independent study” (51). In Kelly’s opinion, using hip-hop texts as nothing more than a stepping stone to bridge the gap between student knowledge and canonical texts only further isolates many students from accepted canonical texts while privileging the predominantly white, Western culture of the canonical texts over the diverse, multicultural nature of hip-hop music. In order to teach literature students, particularly urban and low-income students, to recognize the power behind their own individuality, personal experiences, and cultures, Kelly holds that it is necessary to teach hip-hop texts as a literary form in their own rights without juxtapositioning them against the traditional, Western canonical works. Kelly argues that to deprive modern students of the opportunity to analyze and study literature from this genre not only deprives some students of the opportunity for identification and creation of ownership in a text, but it robs all students of the opportunity to learn about a relevant and culturally diverse art form that plays a major role in modern pop culture. I am a big believer in using genre awareness to teach literature and composition; I also believe that it is important for students to explore genres outside of those seen as traditionally literary. In order to understand the social and cultural nature of genre development, it is critical to analyze both academic and well-known literary genres as well as modern, more recent genres that play a larger role in pop culture. Kelly’s assertion that hip-hop literature is a genre in its own right fits well with the definition of genre that I hope to incorporate into my classroom curriculum. Kelly stresses at several points that non-white students often feel disrespected and isolated in classrooms that focus exclusively on texts from a white, Western literary tradition. Hip-hop literature finds its roots in a much more culturally diverse tradition that has the potential to appeal to a swath of students that may otherwise disengage from classroom activities based on their cultural heritage and feelings of underrepresentation. In my future classroom, I would like to incorporate texts that offer students of non-white backgrounds the opportunity to see their own images and cultures portrayed in a literary work while also offering white students a chance to broaden their expectations for and experiences with literature and cultural traditions. Hip-hop literature provides a culturally relevant and accessible way to do this. Finally, hip-hop texts encourage students to exercise and develop fairly complex literary skills while engaging with material that appeals to their authentic, non-academic interest areas. I believe that it is imperative to construct unit plans in a way that helps students take what they learn in the classroom with them once they leave the classroom. An essential goal in teaching genre theory as a gateway to literary skill is to help students understand the social and developmental nature of genres and be able to apply that understanding to genres they see in their day-to-day lives. Analyzing the genre of hip-hop literature provides a way for students to practice literary analysis on a literary art form that they are already familiar with, have a respect for, and interact with in their nonacademic lives. My classmate, fellow teacher, and blogger friend from Inside the Gradebook opened my eyes to this hidden Internet gem recently and I have not been able to look away. There exists a Tumblr account that publishes Top 40 radio hits rewritten as Shakespearean sonnets; every Thursday a new “pop sonnet” is published. Expect to see such classics as “Girls Just Want to Have Fun” by Cyndi Lauper and “I Kissed a Girl” by Katy Perry adapted into 14 lines and iambic pentameter. Time Magazine even thinks this whole thing is worth noting. Not only is this an incredible way to investigate literary interpretation and adaptation in the high school classroom, it is also a great addition to any study into the affordances and constraints of the Shakespearean sonnet as a genre. The pop sonnets follow the genre norms flawlessly: three quatrains and a couplet following the abab, cdcd, efef, gg rhyme scheme, 14 lines, and iambic pentameter. The author uses Shakespearean vocabulary, turns of phrase, and register, making these pop sonnets a fun and creative way to get students who are new to Shakespeare used to his style and language. The practical classroom applications for these creative and funny poems are extensive. We’ll never know for sure, but I think Shakespeare would be a huge fan of pop sonnets. He looks like the kind of guy who would have gotten a real kick out of all this.